Personally, I love going food shopping. I could happily spend hours traipsing through the aisles, checking out whats on offer, what new products there are and find the experience wholly relaxing (especially at 11pm when the supermarket is eerily calm and quiet). However, there is a train of thought that one should always eat before going shopping so that your eyes do not grow larger than your stomach and go "wild in the aisles"! This tactic is almost essential when you head to Borough market. Although there are lots of stalls selling plenty of scrummy food, I find that the whole place is targeted to tourists and is grossly overpriced. Even so, I love the atmosphere and the buzz and always enjoy picking up a few bits and bobs here. Therefore, before my latest excursion, I needed to fill myself up to try and ensure I didn't go crazy, my wallet would never forgive me. 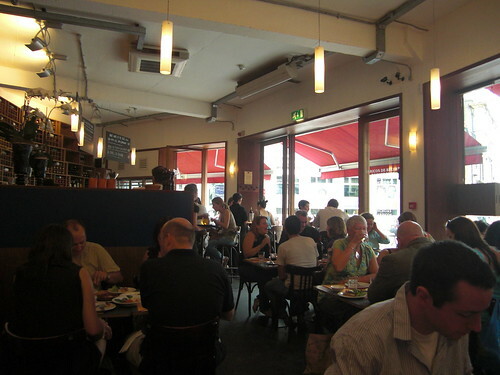 I thought I would treat myself and try out Brindisa on the corner of Borough Market. Tapas has never been one of my favourite types of cuisine but a recent visit to Barrafina had really got my tastebuds going. On arrival, it was Saturday lunchtime and probably not the best time to try and get a table, it was absolutely packed inside and out. But like a miracle, a table for one appeared and I was sat down almost immediately. The menu included all the Spanish tapas favourites (croquettes, spanish tortilla and meats & hams) and I was struggling to choose. Eating on your own isn't really conducive to tapas (I mean, the whole idea is to share, right?) and was slightly disappointed not to be able to give the jamon Iberico a go. However, I settled on a fairly good mix and eagerly anticipated my food. Smooth as you like, this was still soft in the middle and was light and fluffy. 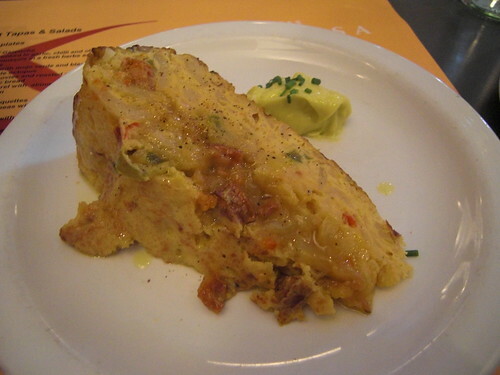 Quite different from the one served at Barrafina (here its served as a slice as opposed to an individial omelette), I actually felt that this one was packed with far more flavour. The chorizo added the savoury notes with the red pepper adding the sweet, a classic combination. The potatoes bulked it out and the sharp garlic hit from the allioli just added an extra dimension. Really lovely. 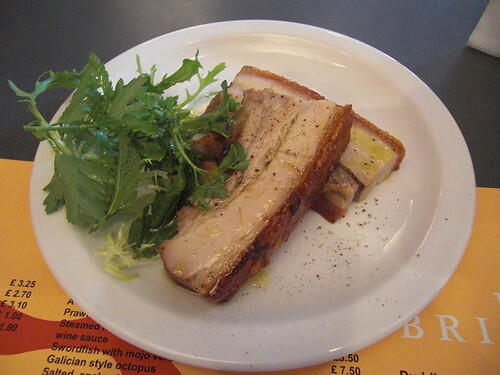 A fairly decent bit of pork belly although it didn't blow me away. It was slightly over done, so arrived a bit tough and the crackling was erring on the side of chewy rather than crispy. The flavours were good although the highlight was the quince sauce. I know that in England, pork is more commonly partnered with apple, but the quince was a great substitute. Sweet but tart, it went well with the rich pork. What better than some fresh peas with nuggets of bacon? 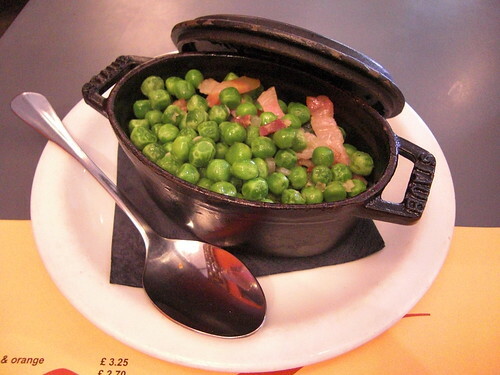 Arriving in a mini creuset dish, it ensured that all the moisture was retained from the peas and mingled together nicely with the juices from the bacon. Although initially a little dry on the top, mixed in with the juices collected at the bottom of the dish, it went well with the pork belly. I wanted to order so much more, but held back and left that for another day for when I can return with some friends. 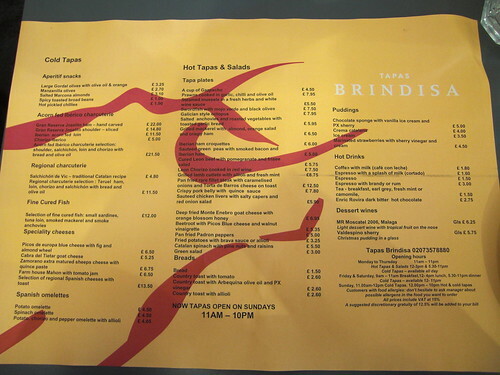 The service was good and efficient, whilst the bill came to just over £20. Hunger sated, I headed off into the melee that is Borough Market on a Saturday, hoping that my bright idea would work.